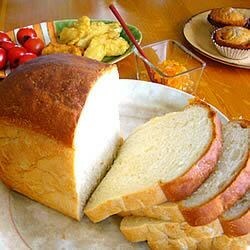 My wife cooked up some delicious Amish White Bread today. We love this recipe, and it requires very simple ingredients that everyone should have as a part of their home food storage (recipe calls for bread flour but normal white all-purpose flour does fine too). No bread maker machine or advanced cooking stills involved. Better than anything you could find in any grocery store or snooty high end bakery. DELICIOUS slathered with butter, jam, peanut butter or Nutella. Makes two loaves, which probably be around for more than 12 hours. Photo shamelessly borrowed from All Recipes--but that's really what it looks like! Crack open some of those bags of flour you have socked away and get baking!